Without a doubt, the key strategy that is discussed and promoted as best practice for AAC is Modeling or Aided Language Stimulation. 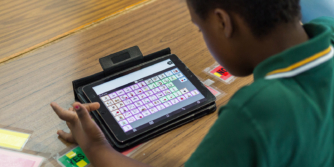 We can all understand the concept that AAC users may not learn how to effectively use their AAC system for communication if they do not see it used regularly and reliably by others in their world. However, although we talk frequently about the importance of modeling, there is often not as much discussion into the “nitty-gritty” of HOW we model. The first part is always to boldly step in and have a go, remembering that any modeling is better than none! When we are just starting to model AAC with individuals, how you model words and language is important. So consider today’s DO and DON’T…. When we focus on modelling the key words in a sentence, it makes us target the most important words needed to convey the meaning of the message. If I model this sentence : “ I GO SHOP GET BANANAS”, even though it is not grammatically complete, the general message of my sentence can be understood. Especially if it is modeled in context as I am telling my friend about what I had done this morning. Key words is a powerful way to demonstrate how we start combining words to build sentences and language, without the demands of having to know/understand the grammar. Unfortunately many of us are grammar warriors. We hate seeing incorrect grammar all around us and the idea that we might model sentences that are not actually grammatically correct, makes us feel anxious! But it is okay - we all need to let that go! Logically, modeling key words before full grammatical sentences should make sense - this is probably how the AAC user will develop their language. They are likely to say and communicate to us in key words, before they start composing sentences, much the same as all children develop language! Everywhere I have ever been, we have always celebrated an individual’s success at combining key words and not stopped to criticise their incorrect grammar. We can get so hung up on getting all the grammar right and all the little words in there, that that small window, that wonderful teachable moment can be lost. It can also lead to frustration for us; especially when we can’t find the right words on the AAC system to make the sentence correctly. Modeling every word is overwhelming! And often that is not real life - does everyone have to time to fully compose a long complex sentence every time? Often we say one or two words in an effort to get our message across quickly and efficiently, which is super important for AAC users too. These can become barriers to us becoming good modeling communication partners! We give up! We feel that we are no good at modeling! We think modeling is too hard! Now if we take away the pressure to model grammatically, and instead think about the key words, we can make a start now and build our language modeling as we get more familiar with the AAC system and as the AAC user starts using it more. When you are modeling on the AAC system, it is totally okay to use the AAC system to model 1-2 words (or however many are needed), whilst saying verbally the complete sentence. For example, I could model on my AAC system “I GO SHOP GET BANANAS”, while saying verbally “I went to the shops to get the bananas”. It is also okay to model the correct grammar at the right time for the individual. For example, if the individual uses his AAC system to say “I GO SHOPS” when asked what he did, then this may be a perfect opportunity to model and show him how he can use grammar supports to find the word “WENT”, or to model little words like “TO” and “THE” on his AAC system. How many words should we model? As a good rule of thumb, it is often recommended that you model words and language that is one step above the AAC learner’s current skill level. So if the AAC learner is not yet using the system to communicate in single words, model at the single word level. For example, if you’re leaving the classroom to go to the library, you can verbally say “It’s time to go to the library” and press the “GO” button on the AAC system when you say the word “go”. Once the AAC learner is at the one word level, you can step up your game – add a word when you model. So if you’re leaving the house to go to see grandmother, you can verbally say “Let’s go see Nanna” and press “GO” and “NANNA” while you’re speaking these words. Keep building your modelling of word combinations to match the language of the AAC user. What kinds of words should we model? It is important to provide lots of modeling of the core building blocks of language - those core words. Showing individuals how they use these core words in different ways, in different word combinations to communicate different things is very powerful! It is important to model that we use different words for different reasons - it is okay to model how to request things (“I want”), but it is really so important to model the language needed to make comments, ask questions, give opinions, describe things, tell news and stories, start conversations and much more. Think of an activity that you like doing with your AAC user/s… what are the KEY WORDS that can be said and modeled during that activity? What kinds of ways will you combine these words when you are modeling? Do you know how to find them in your core word vocabulary? What different kinds of communication reasons (functions) can you model? If they are ready, is there specific grammar that you would like to model and/or teach during the activity?